The Tax Cuts and Jobs Act of 2017 changed the top corporate tax rate from 35% to one flat rate of 21%. This rate will be effective for corporations whose tax year begins after January 1, 2018, and it is a permanent change. The corporate tax rate also applies to LLC's who have elected to be taxed as corporations. This rate does not apply to S corporations (see below). If your corporation's tax year began before January 1, 2018 and it ended after December 31, 2017, you will need to figure and apportion your tax amount by blending the rates in effect before January 1, 2018, with the rate in effect after December 31, 2017. The IRS has a worksheet (on page 18) to help you with this calculation. This information is for corporate tax rates through the 2017 tax year. It is common to say that the U.S. corporate tax rate through 2017 was 35%, but the rate varied from 15% to 35%, depending on the amount of corporate income subject to tax for the year. Corporations file a tax return each year and pay quarterly estimated taxes. Shareholders are not taxed individually for this corporate tax, but they pay tax on dividends they receive. Dividends are taxed only when they are received. The tax on dividends is determined by the number of shares owned and the type of dividends. 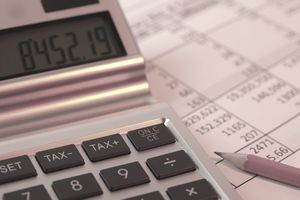 Dividend income for a tax year is reported on the shareholder's personal tax return on Schedule D - Capital Gains and Losses, and this income is included with other income. As you can see, the earnings are taxed to the corporation and the individual shareholders. For this reason, some corporations attempt to avoid the shareholder dividend tax by not distributing dividends. But the IRS can impose an additional tax called the accumulated earnings tax. In addition to the regular corporate taxes, corporations must pay an additional accumulated earnings tax of 20% if the corporation doesn't distribute or pay dividends. formed or availed of for the purpose of avoiding the income tax with respect to its shareholders or the shareholders of any other corporation, by permitting earnings and profits to accumulate instead of being divided or distributed. This tax doesn't apply to personal holding companies, non-profits, or passive foreign investment companies. This tax is imposed by the IRS to prevent corporations from piling up earnings and not distributing them to shareholders in the form of dividends, thus avoiding the tax on the dividends. S corporations are taxed in a different way from corporations. The shareholders of an S corporation are taxed on their percentage share of the taxable income (called a distributive share), passed through to them on their personal tax returns. S corporations don't pay dividends to their shareholders as such, but they may pay shareholders part of that distributive share.